A big change from Milestone Systems: with the release of Milestone XProtect 2014 last week comes a significant change to the number of licenses required when using video encoders to migrate from analogue to IP. Previously, a Milestone XProtect camera license was required for each encoded video channel. For example, a video encoder with say 16 analogue cameras connected to it would require 16 Milestone XProtect device licenses. This is no longer the case. Take a look at the latest releases from Panasonic and Vivotek, now available for purchase. The WV-SC384 is a new addition to Panasonic’s pan-tilt-zoom SmartHD camera range and is very similar to the WV-SC385 model with the only difference being that it does not have a removable infrared cut filter, meaning the WV-SC384 is more suited to day-time operation only whereas the popular WV-SC385 is true day / night and can be used for 24/7 operation. Both cameras benefit from features such as Wide Dynamic Range (WDR), on-board SD-card recording for backup and 18x optical zoom, which combined with the HD 720p resolution provides crisp, detailed footage of objects and activity at long distances. The WV-SC384 is available as an indoor unit as well as an outdoor bundle. The odd thing is that Panasonic has launched the WV-SC384 at a higher price point than the WV-SC385, which you would not expect given the true day/night facility in the latter. We expect this will be corrected over time, at which point this camera will become very attractive indeed in the marketplace. Something which caught our eye recently is the new 2 megapixel outdoor camera from VIVOTEK, the IP7361. 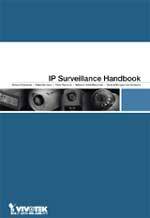 VIVOTEK have just announced the release of their IP Surveillance Handbook. The handbook is aimed at security installers and system integrators and hopes to enhance the level of knowledge about IP surveillance and IP CCTV systems. The book takes you through the basics of IP cameras, video servers and recording solutions, covering hardware, lenses, sensors, camera housings etc. 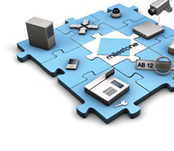 It also looks at IP-specific areas such as networking, bandwidth, video management and system design and provides the reader with the knowledge to help supply cost-effective IP video surveillance systems that truly match their customer’s requirements. We think the book is a good read for system installers, integrators and end-users alike. The more information that is available on IP video, the more the industry will begin to see the benefits of making the jump from analogue CCTV to digital IP CCTV.